December 2017 - TheUrbanMusicScene.com | Concerts & Festivals! MIAMI GARDENS, Fla., Dec. 8, 2017 /PRNewswire/ — The City of Miami Gardens announces the highly anticipated 2018 artist lineup for its 13th annual Jazz in the Gardens (JITG) music festival, the signature event for this vibrant community. 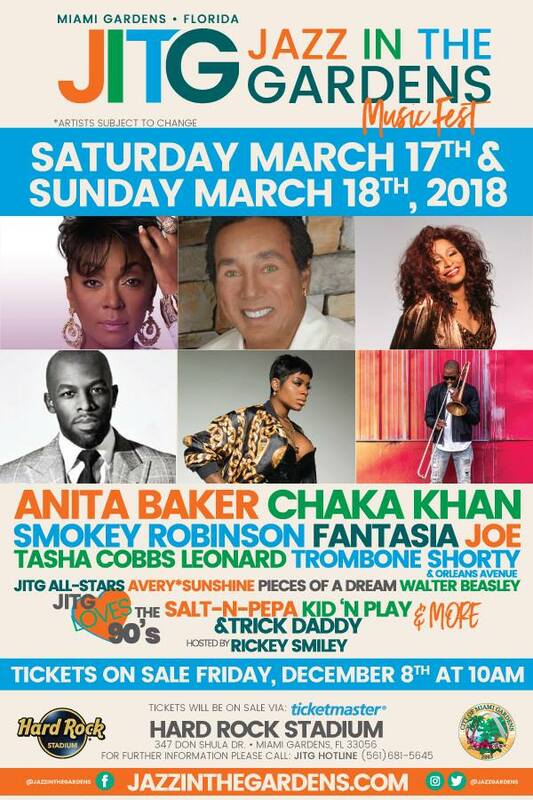 On March 17-18, 2018, fans will again experience the ultimate festival event featuring the world’s top artists from the R&B, soul, jazz, hip-hop, and funk genres.